Rev. Wesley J. Ewing: Did he Harbor a Mass Murderer? Lewis (Lou) Enarson pulled his buggy to a stop outside Villisca’s Presbyterian parsonage at 6:30 p.m. Sunday evening, June 9, 1912. It was some 6 hours before the Villisca, Iowa axe murder, so he and his passenger were still living in the simple, innocent world of Villisca before the tragedy. Lou’s rider was Reverend Lyn George Jacklin Kelly who was to be an overnight guest of Presbyterian minister Wesley J. Ewing. Rev. 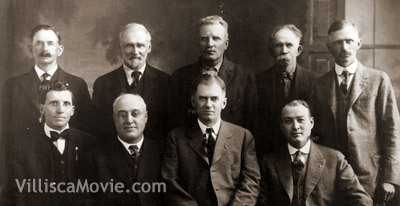 Kelly (see photo below-left), a tiny 5’2” tall man with red hair and blue eyes, had been preaching in Methodist churches across the Midwest since his arrival from England in 1904. Now, in the summer of 1912, he had left the Methodist denomination and enrolled in the Omaha Presbyterian Seminary for the fall term. That school had arranged for him to serve the Macedonia, Iowa, Cumberland Presbyterian Church that summer. As an additional charge, he was to serve the Arlington and Pilot Grove rural churches northwest of Villisca. 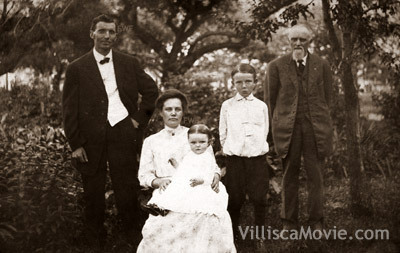 This meant a trip to Villisca, every other weekend that summer and explained why Kelly was staying the night with Presbyterian Pastor W. J. Ewing and family (see photo below). The Ewings and their guest shared a hurried supper for they had to be at the church before 8:00 o’clock for the Children’s Day service that night. This program, presented by the Sunday School children, was among the church year highlights. Even though Rev. Ewing had no direct involvement in the service, his wife shared director responsibilities with Sara Moore so it was doubly important they be on time. The service was a great success. Children sang, recited, and performed to the delight of parents and friends. Joe Moore beamed from the back of the church when his youngest, Paul lisped out his little recitation which ended, “…and Jesus loved even me.” Taking it all in was Rev. Ewing and the visiting Rev. Kelly, both sitting just across the aisle from Joe Moore. The service ended about 10:00 p.m. with family groups chatting as they walked out into a cloudy, damp June night. Joe and Sara Moore, their four children and the two Stillinger girls who were to spend the night with them paused on the church steps to exchange greetings with the Curtis family completely unaware that they had only two hours to live. Rev. Ewing and his family, accompanied by their English guest, also went home where Ewing and Kelly sat talking until nearly 11:00 p.m. Kelly was then shown to his upstairs bedroom while the entire Ewing family retired to a tent in the back yard. That somewhat strange sleeping arrangement was necessitated by Rev. Ewing’s severe and persistent nasal and throat infections which he hoped would be relieved by the night air. Rev. Kelly returned to Macedonia on westbound No. 5 Monday morning at 5:19 a.m. so he was out of town long before the Ewings awoke. By 9:00 a.m. Rev. Kelly was forgotten by both the Ewing family and everybody else at the Children’s Day service because the Villisca axe murder had been discovered. As pastor for the slain family, Ewing was at the center of the terrible week that followed the murder. His primary role was that of preacher at the mass funeral on Wednesday (see photo above). His sermon has not been preserved, but newspapers highlighted his demand for justice coupled with a plea for citizens to control their passions if and when the killer was caught. Two weeks after the murder Rev. Kelly reprised his first visit to Villisca. Again he preached at the country churches, stayed with the Ewings, but rather than leave early Monday morning he elected to wait for a later train. That was because he had asked Ewing to arrange a visit to the murder house (see photo below). Consequently he and Ewing found themselves outside Joe Moore’s house at midmorning when, as luck would have it, a group of Investigators arrived. These official visitors were Henry Sampson, Assistant Attorney General for the state of Iowa; Montgomery County Attorney Ratcliff; Ross Moore, Joe’s brother, and detective Tom O’Leary from the John Hayes Detective Agency of Kansas City. In a measure of the informality of the time, these investigating officials were perfectly happy to have two local ministers join them on their foray into the house. Kelly was delighted, nosing in every nook and cranny, even turning up a small vial he said he found under the bed in the downstairs bedroom. He also noted what he thought was a thumb print on a door frame and placed his own thumb against it to see how well they matched. This house tour ended Rev. Ewing’s direct involvement in the case. 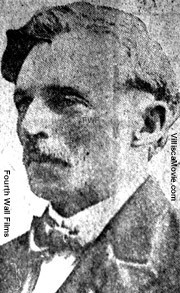 Kelly never stayed in his house again, but during that summer of 1912, Ewing was perhaps the only Villisca lay person to know Kelly had become a suspect in the investigation. That knowledge came from a stream of investigators who had talked with Marshall Horton and passed the information along to during visits to Rev. Ewing. What could he tell them about Preacher Kelly? Was he sure Kelly stayed in the house after they retired to the back yard? Had his bed been slept in that night? Though definitive evidence is not in the record, we can be sure Ewing did not believe in Kelly’s guilt. In fact, Ewing became such a strong supporter of Detective Wilkerson and his case against Iowa State Senator F. F. Jones that he was named along with eight other locals and Wilkerson (see photo below) in the original slander suit Jones filed in the fall of 1916. Ewing and his eight compatriots all expressed the hope that Jones’ suit would finally lead to the truth being revealed and expressed a perfect willingness to stand trial for that end. F. F.’s lawyers were not so happy with his rash decision to expand his case against Wilkerson by including eight local citizens, all of whom were respected and several of whom were related to the murder victims. Forget local citizens and concentrate on Wilkerson, the outsider. Strike the head and the snake will die. Following this wise counsel, F. F. dropped the Villisca eight from his suit and entered into a legal duel with Wilkerson in November of 1916. Ewing’s interest in the murder and Villisca itself was nearly over. 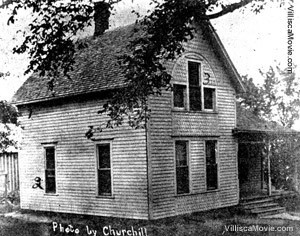 Perhaps because of his involvement in the controversies surrounding the murder, he left Villisca in the late summer of 1917 to accept a pastorate at the Presbyterian Church in Deep River, Iowa. 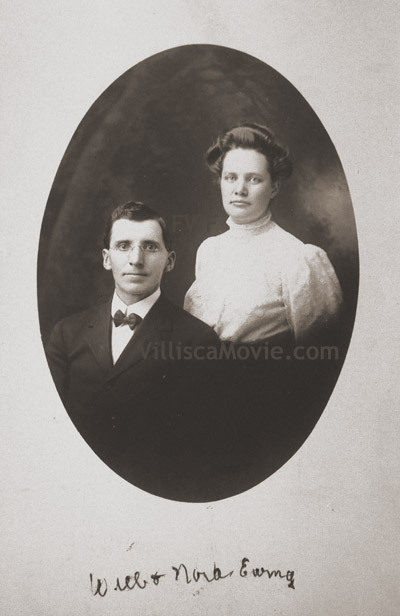 Both he and his wife (see photo below) were called back to Villisca to testify in the 1917 Kelly trial regarding whether Kelly’s bed had been slept in during the murder night. Both he and his wife said it had been. Rev. Ewing who had been born in Glenwood, MN, in 1872, educated at Alma College in Michigan and received his ministerial training at McCormick Theological Seminary in Chicago had very little time left after he testified at the Kelly trial in September of 1917. Still plagued with upper respiratory problems, he received an examination at the University of Iowa hospital in March of 1918, when his son was having his appendix removed. Based on this examination, doctors removed his tonsils and found a nasal polyp which should also come out. A few days later, Rev. Ewing had the nasal surgery but complications followed. First, there was excessive bleeding which was followed by pneumonia resulting in his unexpected death in March of 1918. 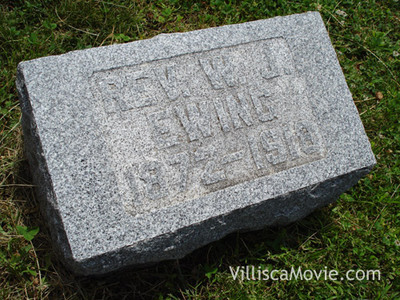 That Villisca had a profound impact on his life is proven by his being returned to Villisca for burial. At 2:30 p.m. on the 27th of March 1918, Rev. 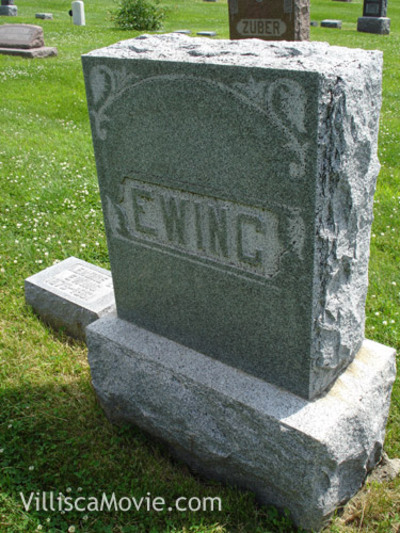 Wesley Ewing was the subject, not the preacher of a funeral sermon, followed by his burial in the Villisca cemetery.